Glycine receptor subunit alpha-1 is a protein that in humans is encoded by the GLRA1 gene. The inhibitory glycine receptor mediates postsynaptic inhibition in the spinal cord and other regions of the central nervous system. 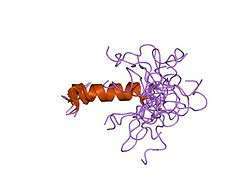 It is a pentameric receptor composed of alpha and beta subunits. The GLRB gene encodes the beta subunit of the receptor. Mutations in the gene have been associated with hyperekplexia, a neurologic syndrome associated with an exaggerated startle reaction. ↑ "Drugs that physically interact with Glycine receptor subunit alpha-1 view/edit references on wikidata". ↑ Ryan SG, Sherman SL, Terry JC, Sparkes RS, Torres MC, Mackey RW (Sep 1992). "Startle disease, or hyperekplexia: response to clonazepam and assignment of the gene (STHE) to chromosome 5q by linkage analysis". Ann Neurol. 31 (6): 663–8. doi:10.1002/ana.410310615. PMID 1355335. ↑ Shiang R, Ryan SG, Zhu YZ, Hahn AF, O'Connell P, Wasmuth JJ (Mar 1994). "Mutations in the alpha 1 subunit of the inhibitory glycine receptor cause the dominant neurologic disorder, hyperekplexia". Nat Genet. 5 (4): 351–8. doi:10.1038/ng1293-351. PMID 8298642. ↑ "Entrez Gene: GLRA1 glycine receptor, alpha 1 (startle disease/hyperekplexia, stiff man syndrome)". ↑ Tijssen MA, Shiang R, van Deutekom J, Boerman RH, Wasmuth JJ, Sandkuijl LA, Frants RR, Padberg GW (June 1995). "Molecular genetic reevaluation of the Dutch hyperekplexia family". Arch. Neurol. 52 (6): 578–82. doi:10.1001/archneur.1995.00540300052012. PMID 7763205. ↑ Zhou L, Chillag KL, Nigro MA (October 2002). "Hyperekplexia: a treatable neurogenetic disease". Brain Dev. 24 (7): 669–74. doi:10.1016/S0387-7604(02)00095-5. PMID 12427512. Ruiz-Gómez A, Vaello ML, Valdivieso F, Mayor F (1991). "Phosphorylation of the 48-kDa subunit of the glycine receptor by protein kinase C". J. Biol. Chem. 266 (1): 559–66. PMID 1845981. Grenningloh G, Schmieden V, Schofield PR, Seeburg PH, Siddique T, Mohandas TK, Becker CM, Betz H (1990). "Alpha subunit variants of the human glycine receptor: primary structures, functional expression and chromosomal localization of the corresponding genes". EMBO J. 9 (3): 771–6. PMC 551735 . PMID 2155780. Langosch D, Herbold A, Schmieden V, Borman J, Kirsch J (1994). "Importance of Arg-219 for correct biogenesis of alpha 1 homooligomeric glycine receptors". FEBS Lett. 336 (3): 540–4. doi:10.1016/0014-5793(93)80872-R. PMID 7506679. Shiang R, Ryan SG, Zhu YZ, Fielder TJ, Allen RJ, Fryer A, Yamashita S, O'Connell P, Wasmuth JJ (1995). "Mutational analysis of familial and sporadic hyperekplexia". Ann. Neurol. 38 (1): 85–91. doi:10.1002/ana.410380115. PMID 7611730. Baker E, Sutherland GR, Schofield PR (1995). "Localization of the glycine receptor alpha 1 subunit gene (GLRA1) to chromosome 5q32 by FISH". Genomics. 22 (2): 491–3. doi:10.1006/geno.1994.1419. PMID 7806244. Rees MI, Andrew M, Jawad S, Owen MJ (1995). "Evidence for recessive as well as dominant forms of startle disease (hyperekplexia) caused by mutations in the alpha 1 subunit of the inhibitory glycine receptor". Hum. Mol. Genet. 3 (12): 2175–9. doi:10.1093/hmg/3.12.2175. PMID 7881416. Ryan SG, Buckwalter MS, Lynch JW, Handford CA, Segura L, Shiang R, Wasmuth JJ, Camper SA, Schofield P, O'Connell P (1994). "A missense mutation in the gene encoding the alpha 1 subunit of the inhibitory glycine receptor in the spasmodic mouse". Nat. Genet. 7 (2): 131–5. doi:10.1038/ng0694-131. PMID 7920629. Langosch D, Laube B, Rundström N, Schmieden V, Bormann J, Betz H (1994). "Decreased agonist affinity and chloride conductance of mutant glycine receptors associated with human hereditary hyperekplexia". EMBO J. 13 (18): 4223–8. PMC 395349 . PMID 7925268. Schorderet DF, Pescia G, Bernasconi A, Regli F (1995). "An additional family with Startle disease and a G1192A mutation at the alpha 1 subunit of the inhibitory glycine receptor gene". Hum. Mol. Genet. 3 (7): 1201. doi:10.1093/hmg/3.7.1201. PMID 7981700. Bormann J, Rundström N, Betz H, Langosch D (1994). "Residues within transmembrane segment M2 determine chloride conductance of glycine receptor homo- and hetero-oligomers". EMBO J. 13 (6): 1493. PMC 394970 . PMID 8137830. Milani N, Dalprá L, del Prete A, Zanini R, Larizza L (1996). "A novel mutation (Gln266-->His) in the alpha 1 subunit of the inhibitory glycine-receptor gene (GLRA1) in hereditary hyperekplexia". Am. J. Hum. Genet. 58 (2): 420–2. PMC 1914546 . PMID 8571969. Brune W, Weber RG, Saul B, von Knebel Doeberitz M, Grond-Ginsbach C, Kellerman K, Meinck HM, Becker CM (1996). "A GLRA1 null mutation in recessive hyperekplexia challenges the functional role of glycine receptors". Am. J. Hum. Genet. 58 (5): 989–97. PMC 1914607 . PMID 8651283. Elmslie FV, Hutchings SM, Spencer V, Curtis A, Covanis T, Gardiner RM, Rees M (1996). "Analysis of GLRA1 in hereditary and sporadic hyperekplexia: a novel mutation in a family cosegregating for hyperekplexia and spastic paraparesis". J. Med. Genet. 33 (5): 435–6. doi:10.1136/jmg.33.5.435. PMC 1050620 . PMID 8733061. Monani U, Burghes AH (1997). "Structure of the human alpha 2 subunit gene of the glycine receptor--use of vectorette and Alu-exon PCR". Genome Res. 6 (12): 1200–6. doi:10.1101/gr.6.12.1200. PMID 8973915. Seri M, Bolino A, Galietta LJ, Lerone M, Silengo M, Romeo G (1997). "Startle disease in an Italian family by mutation (K276E): The alpha-subunit of the inhibiting glycine receptor". Hum. Mutat. 9 (2): 185–7. doi:10.1002/(SICI)1098-1004(1997)9:2<185::AID-HUMU14>3.0.CO;2-Z. PMID 9067762. Vergouwe MN, Tijssen MA, Shiang R, van Dijk JG, al Shahwan S, Ophoff RA, Frants RR (1998). "Hyperekplexia-like syndromes without mutations in the GLRA1 gene". Clinical neurology and neurosurgery. 99 (3): 172–8. doi:10.1016/S0303-8467(97)00022-X. PMID 9350397.